In 1996, the town of Laurens, South Carolina, was thrust into the international spotlight when a white supremacist named Michael Burden opened a museum celebrating the Ku Klux Klan on the community's main square. Journalists and protestors flooded the town, and hate groups rallied to the establishment's defense, dredging up the long history of racial violence in this formerly prosperous mill town. What came next is the subject of an upcoming major motion picture starring Forest Whitaker, Garrett Hedlund, Tom Wilkinson, Andrea Riseborough, and Usher Raymond. Shortly after his museum opened, Michael Burden abruptly left the Klan at the urging of a woman he fell in love with. Broke and homeless, he was taken in by Reverend David Kennedy, an African American preacher and leader in the Laurens community, who plunged his church headlong in a quest to save their former enemy. In this spellbinding Southern epic, journalist Courtney Hargrave uncovers the complex events behind the story told in the film--20 years in the making from writer-director Andrew Heckler, and winner of the 2018 Sundance Audience Award. 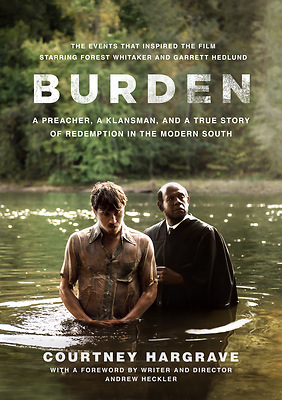 Hargrave explores the choices that led to Kennedy and Burden's friendship, the social factors that drive young men to join hate groups, the intersection of poverty and racism in the divided South, and the difference one person can make in confronting America's oldest sin. Temporarily out of stock, more on the way! Order now, item will be available on 10/8/2019.